The noise is everywhere, making it more challenging than ever for your message to be heard. With so much noise , how is it possible to get noticed, stay top of mind, or even get your brand off the starting line? The goal isn’t to get noisier, that would be the answer if your were looking to be more annoying. Business will not just find you, you have to go and get it. But how can you get more business and rise to the top, above the noise and get noticed? Catch people in the act. Getting caught in act is not about finding people doing something wrong. This time, catch them doing something right. People respond well to compliments and businesses respond the same way. If a brand you want to get noticed by does something good, let them know it. Create a “social scene” if they have done something good for their community. Tweet it out. If they have resolved a problem with a customer, let it be known how quickly the issue was brought to resolution. Too often companies are chastised for doing something wrong. Not often enough are they given praise. If a brand you are trying to build a relationship with does something right, catch them in the act, and it will get you noticed. Action item: Write a handwritten “caught in the act” letter to a company you are trying to do business with and watch how quickly they notice you. Add value to your relationships. Don’t make it about you. Spend more time on what you can do for those you want to be noticed by. As an self-help, business book writer, in a field filled with hundreds of other authors I work hard to promote my book, Nice Guys Finish First. Although there are dozens of podcasts that can help promote my book, the field is still very crowded and gaining access to podcasts is not an easy feat. Instead of sending an email describing the benefits of the book to their audiences, I tell them how I will be able to help promoted their show, sharing not just my episode but other episodes as well with my social network and email list. I’ve been told several times I was selected as a guest because of my willingness to share information with others and that I did not come across as selling. Action item: Write a list of 3 ways that you can add value to a brand you wish to pursue. In other words, what can you offer them and in what ways can you help them to achieve their mission. Be unique. Don’t be normal. Normal is a setting on your washing machine. Be unique, creative or downright entertaining. That doesn’t mean that you have to break into song when you walk into your office or start tap dancing when get into the parking garage. A friend of mine, Ted Rubin is known for wearing crazy socks. Before delivering a keynote, audience members have remarked, “I wonder what socks Ted has on today?” Bowties, eye glasses or cufflinks are great ways to gently show your unique nature. Maybe fashion isn’t your thing, and that’s ok. To be unique and add a bit of personality to my emails, I sign almost every email with an “XOXO.” I’ve gotten email responses from people thanking them for the smile and the X’s and O’s. Action item: Make it your goal today to do something unique to get yourself noticed. If that scares you, start small, but realize your uniqueness will set you apart from the rest of the world. Be uniquely you. Put yourself out there. In order to get noticed you have to take action, starting today, right now. Open your mouth, let your opinion be known, be remarkable and go big or go home. Putting yourself out there might mean volunteering for a project at work, stepping outside your comfort zone, doing something that you have never done before and taking some risk. Risk does not mean reinvention. You don’t have to turn your life upside down if the risk outweighs the potential reward, but push yourself beyond the walls that you have built around yourself for so many years. Stop telling yourself NO and start telling yourself YES. Life comes at you fast, take control of the direction you are heading on the path you are on. Action item: Putting yourself in a position to be noticed is about putting one foot in front of the other and taking baby steps. Sign up for Toastmasters Club or attend a networking meeting and take control of your future today. Work hard to eliminate mediocre, average and an attitude of insignificance from anything you do. Each action step you take will help get you noticed. 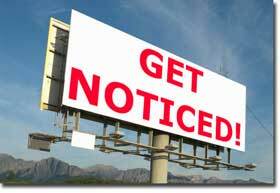 Getting noticed will help grow your existing relationships and will help build new relationships relationships as well. As an added bonus, the more you get noticed, the more confident you will become. Keep in mind, in order to see growth you will need to approach these changes with a genuine desire to improve and help others in the process and that’s so much more cost effective (and helpful) than renting out Time Square.